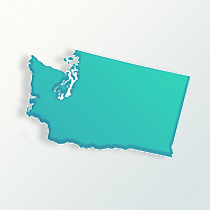 The state in the far northwest portion of the country borders the Pacific Ocean and the nation of Canada. The Spanish Captain de Heceta claimed the northern coastal lands along the Pacific for Spain in 1775. The English explorer Capt. James Cook in 1778 and Capt. George Vancouver in 1792 traveled the shore of Washington. In 1790 more nations became interested in trading started traveling to the Washington coast. The American captain Robert Gray established trade in sea otter pelts. Explorers with Lewis and Clark in 1805 were in Washington. By 1818, the United States and England agreed to share the lands, yet disputes over borders with Canada and the Oregon areas continued. It would be 1846 before England ceded all claims to lands south of the 49th parallel to the United States. As more Europeans came to the area, the Native Indians such as Nez Perce and Cayuse suffered from their diseases. New settlement with families came into the territory and settled New Market, in 1846. In 1852, people from all over what was to become Washington state gathered in Monticello (now Longview) to draft a memorandum to Congress. The memorandum expressed their desire to be granted statehood under the name of Columbia. It was decided that a state named Columbia might be confused with the preexisting District of Columbia. Instead, named Washington in honor of the first U.S. President, George Washington. The state joined in November 11, 1889 as the 42nd state. The numerous immigrants arrived for the state’s agriculture and lumber industries is an important aspect in looking at Washington genealogy. In the eastern portion, apples and wheat were grown. Along the Pacific coast was the fishing and salmon canning industry. Shipbuilding became very important to the economic, providing jobs for those migrating to the state. The population rose from 11,600 in 1860 to 357,230 in 1890. In 1910, the state reached the 1.1 million mark in population. By 1950 the state was at 2.3 million and in 2009 the state of Washington was at 6.7 million citizens. From 1860 to 1900 were the top decades of new settlers into Washington. Most new arrivals were Germans, Irish and English. Those of English-Irish heritage represent about 30 percent of the state. Those of German descent are 21 percent. The Norwegian heritage is represented by 6.2 percent and Sweden population at 4 percent. The Roman Catholic faith is represented at 16 percent and the Protestant religions at 49 percent. Examining Washington genealogy the larger Protestant numbers are because of the many English, German, Norwegian and Sweden descendants in Washington. New industries for Washington include the manufacturing of aircraft and computer software development. The Microsoft Corporation is one of the largest employers.